Note: This feature is only available on our Professional level plan and above. This feature is only active when a user opens the app. If you would like more options and control over access to different areas of your app, we recommend that you use the Advanced Access Settings instead which you can learn more about here. If you would like to access the Access Code Tab in order to set up an access code, simply click on “Settings” then “Access Code”. What is the Access Code Tab’s primary function and what are the steps to accomplish it? As stated before, the Access Code Tab allows you to set up an access code for your app which when enabled, will need to be entered in every time a user opens your app. Let’s go over the steps on how to set up and enable an access code for your app. Next type in the code that you want to use in your app in the “Access Code” box. Make sure that you notify all of your app’s intended users what the code is as it is case-sensitive. Once you have typed in the code that you want to use click “Update”. 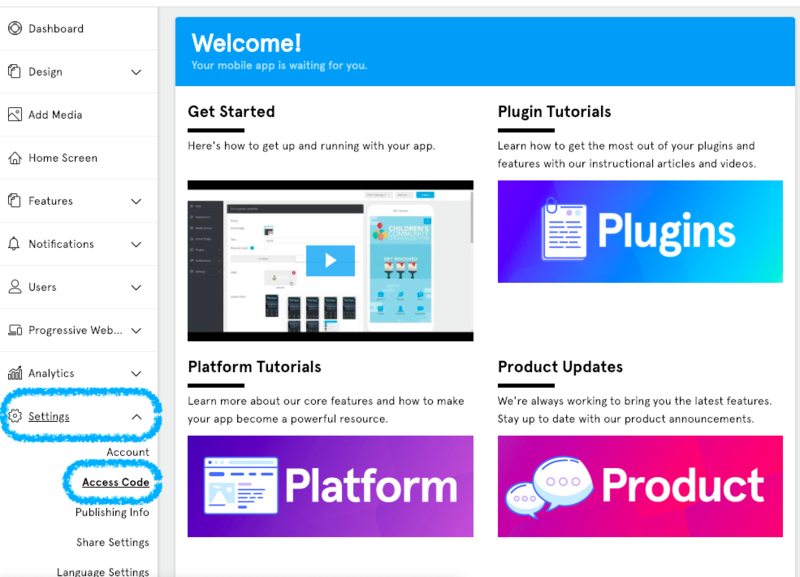 Then click the “Publish” button at the top of the app dashboard to push the code out to the live app. To update a pre-existing access code, simply type in the new code that you want to use, click “Update” then “Publish” to push that new code out to the live app. Note: We highly recommend that if you want to have an access code set up for your app that you don’t set it up until after your app has gone through Apple and Google’s review. Otherwise you may run into a rejection by Apple or Google. We also recommend that you disable it whenever your app is resubmitted to Apple and Google. To disable the access code you’ll need to delete the code that you originally typed in, click “Update” then uncheck the box next to “Enable Access Code”. Once that’s done click “Publish” at the top of the app dashboard to push the change to your app. You can always re-enable it later once your app has completed the review process.